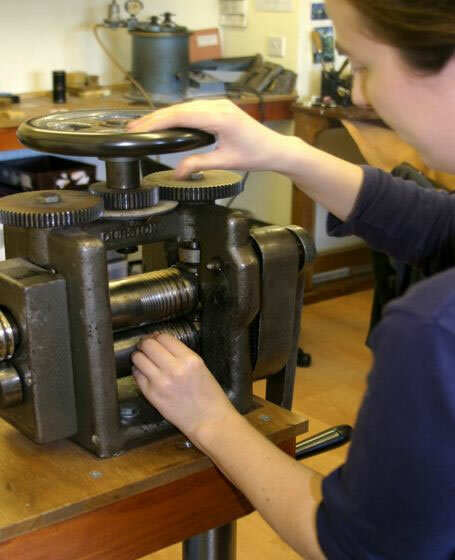 All of the stages involved in the making of jewellery, from design through working of raw precious metals onwards, are carried out by our jewellers at our workshop. 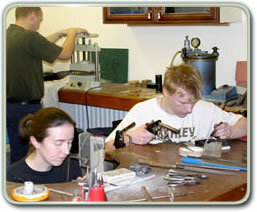 The jeweller's bench is the hub of production. Traditionally the half-circle recess gives access to a wide working area with a "bench pin" at its centre. The wooden pin supports work in hand and each craftsperson will customise his or her pin to suit individual working styles. 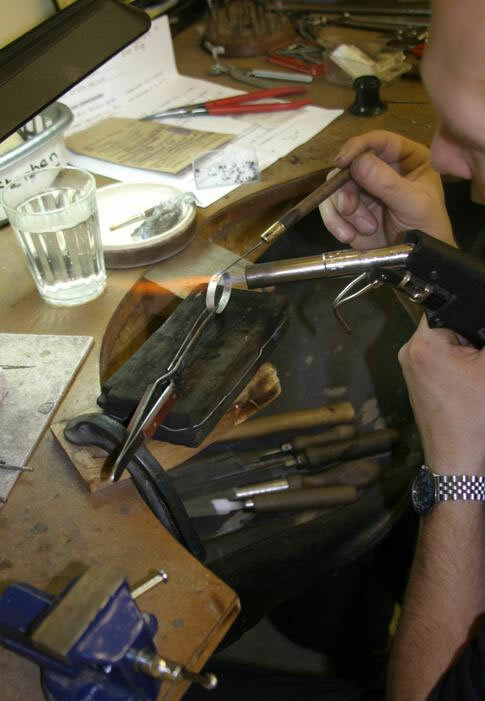 Jewellery is primarily made by piercing out metal. 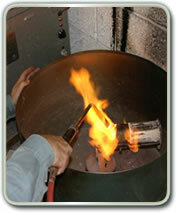 Heat is often used to soften metal, or anneal, and to join components together, or solder. The metal work-piece is laid on a charcoal block which absorbs the torch flame. A soft, fine flame is used for most jobs. Precious metals can be punched into almost any shape. 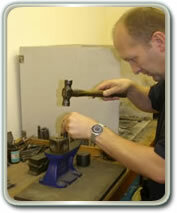 A doming-block with graded semi-spherical holes is used to punch a flat into a dome. 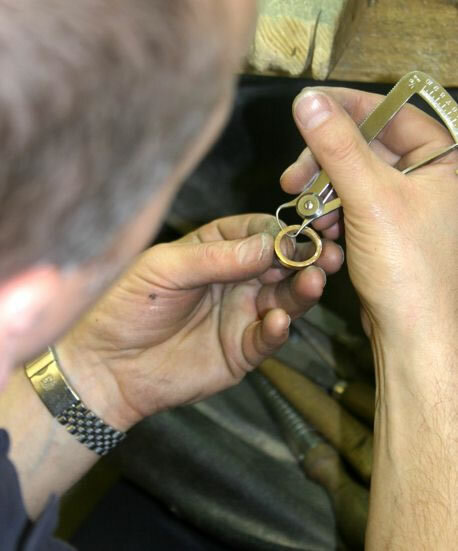 Metals used in jewellery are chosen for their beauty, durability and workability. 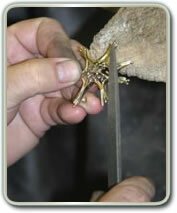 Gold and silver do not corrode, are easily manipulated and take a high polish. 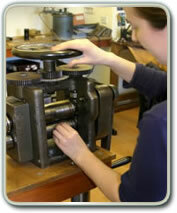 Basic processes are sawing, filing and drilling. 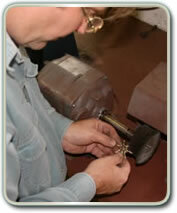 Filing gradually smoothes sharp edges and reduces metal to the required shape and size. Care of every detail requires regular and precise measurement. The rolling mill is integral to working metals. 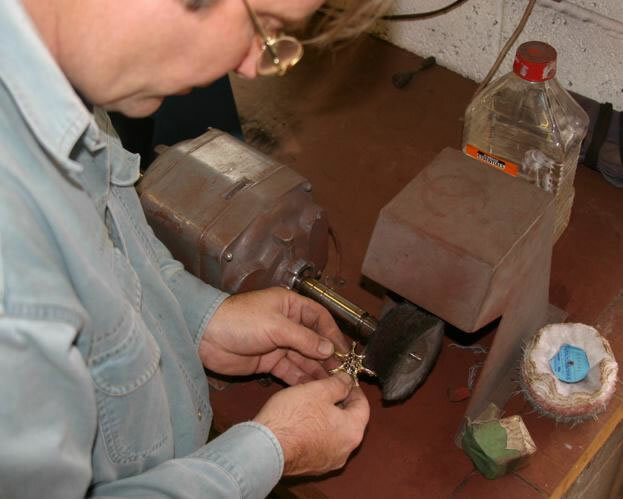 Sheet and wire are milled down until they reach the correct gauge. 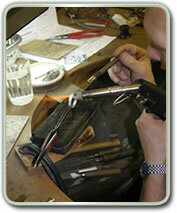 Precise soldering is the forte of an experienced jeweller. 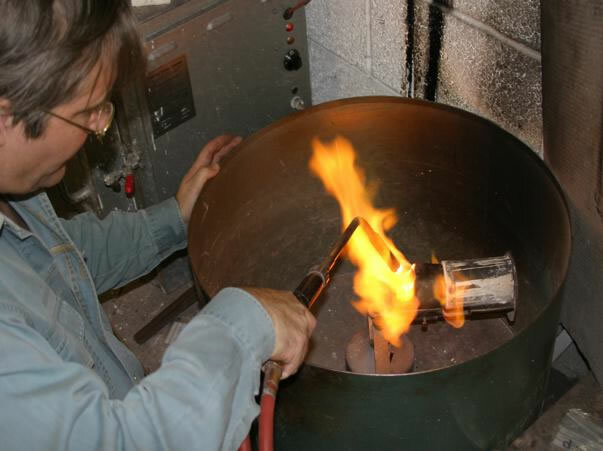 Solder is an alloy with a lower melting point than that of the metal being joined, but must be matched to the metal. Some pieces require many soldering stages. Stages of casting. 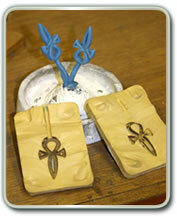 The rubber mould was made from a pendant........cross. 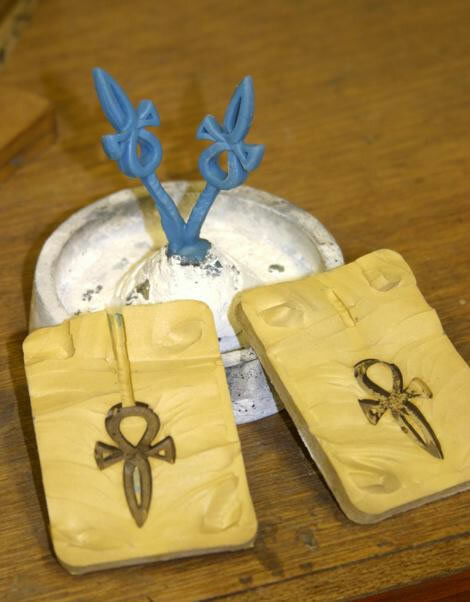 Wax is injected into the mould, creating copies which are then put onto a 'tree'. A metal flask is placed over the tree and plaster poured in to make a mould. 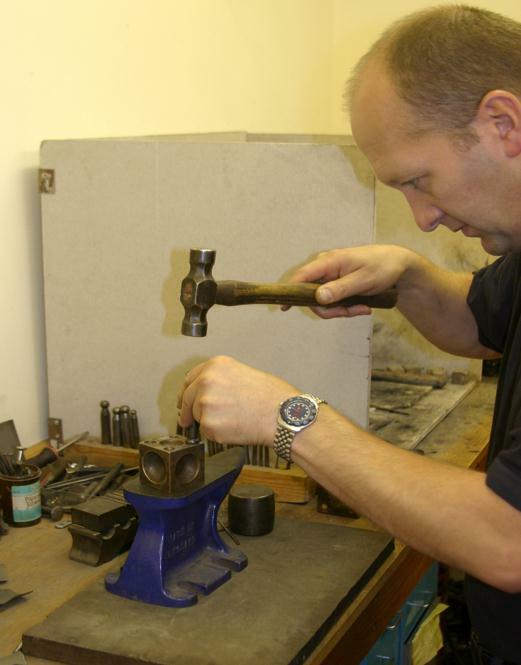 Polishing requires great patience and dexterity. 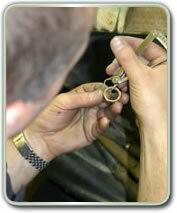 A detailed piece can take many hours of polishing to achieve a high mirror-finish. Different gauges of mop are used with jeweller's rouge to remove all marks and scratches. 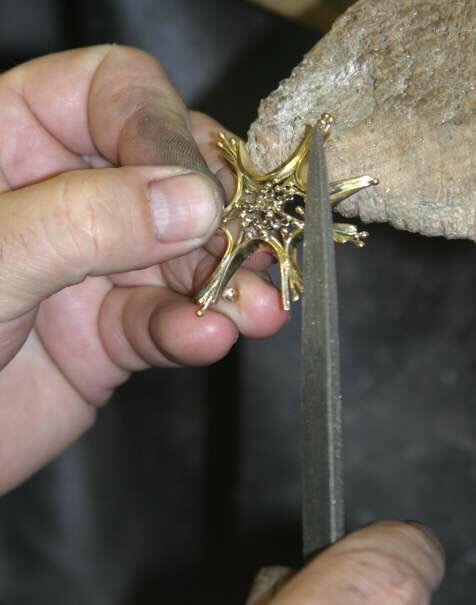 Lost wax casting is an ancient technique which plays an important part in jewellery manufacture. It can produce unusual textures and reduce manufacturing time for components. 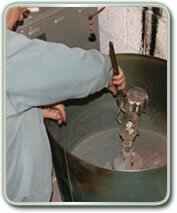 The flask containing the mouldings is heated in a kiln to burn out the wax. Whilst still hot it is carefully placed in a centrifugal machine; molten metal is then prepared in the crucible on the opposite arm. 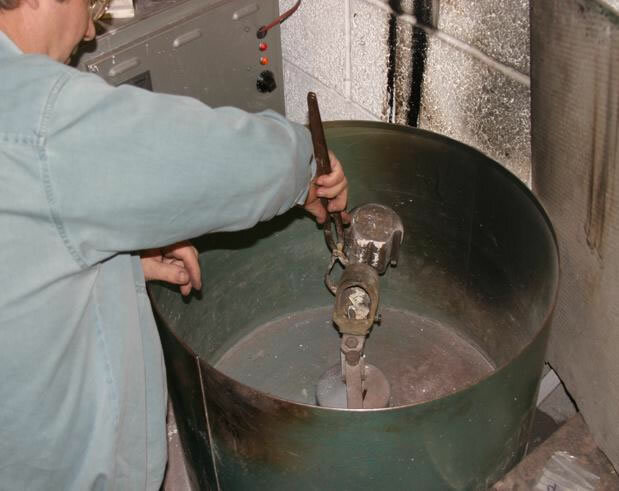 When the centrifugal machine is 'fired' molten metal is forced into the opening to fill the void left by melting the wax -- hence the 'lost wax' technique.